Guest post from Dr. Susan L. Bennett, PhD, CEDS, clinical advisor at the Gaudiani Clinic. I am frequently asked, “What is Orthorexia Nervosa?” Often, the next question is, “Where is it in the Diagnostic and Statistical Manual of Mental Disorders, Fifth Edition (DSM-5)?” These are good questions, the answers to which I hope will be helpful to anyone with similar questions. First, if we look at the history of Orthorexia Nervosa we find it was first suggested in the mid-1990s by a physician who found that some individuals were obsessed with eating only “clean, healthy, pure” foods to achieve “ideal” health. However, the very thing they hoped to attain was thwarted by outcomes that negatively impacted the body, social functioning, and daily activities in addition to resulting in high levels of anxiety. In the most severe cases, malnutrition and death could occur as food groups were further refined and/or eliminated altogether. Eating healthy is valued and increasingly emphasized by many groups in our culture. For example, athletes attempt to enhance performance with diet, or individuals receiving a concerning health-related diagnosis may receive recommendations or might be advised to make dietary changes to improve health outcomes. 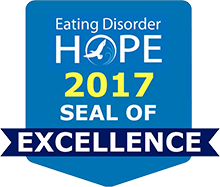 Making important dietary changes can be beneficial or even lifesaving for many individuals and alone do not create a disorder. However, when the changes become obsessive and fixated the potential for developing disordered eating and potential medical compromise increases. Often, in these cases, significant weight loss and/or nutritional deficiency first comes to the attention of a medical professional. Even though individuals presenting with Orthorexia are restricting by focusing on purity and subsequently become fixated dietarily, this presentation has not been exclusively recognized as an eating disorder by the American Psychiatric Association. This is primarily because there was a paucity of Orthorexia research during the last revision of the DSM and, therefore, provided an inadequate evidence base to add criteria for an additional eating/feeding disorder. Importantly, the constellation of symptoms in Orthorexia vary from Anorexia Nervosa, Bulimia Nervosa and Other Specified Feeding and Eating Disorder based on the absence of a negative evaluation of one’s body influenced by weight, shape or fear of gaining weight. In other words, in the case of Orthorexia the individual is losing weight due to food choices but not due to a drive to be thin. As clinicians, diagnoses help us understand our clients’ struggles and how we can most effectively provide therapeutic support. Understanding the subtleties and differential diagnoses helps us to assess appropriately and adapt interventions. While there is no category specific to Orthorexia, the disorder is in fact captured in the DSM-5. Specifically, Avoidant/Restrictive Food Intake Disorder (ARFID) is a broad diagnostic category that holds Orthorexia as well as other eating or feeding disturbances. The first criterion (A) outlined in the DSM-5 are met as follows: There is an avoidance or restriction of food intake and nutritional/energy needs are inadequate. Additionally, the disturbance is not better explained by a lack of food resources or a result of standard cultural practices, an active course of anorexia or bulimia, a disturbance of body weight and shape, nor a cooccurring medical or mental disorder unless the response to the medical or mental condition is more severe than typical for the condition. Orthorexia Nervosa is diagnosed as ARFID, which differs from other eating disorders in important ways already discussed. Therefore, it is important to adapt interventions so clients are not alienated during important recovery work. For instance, using eating disorder modalities that address body image disturbances and fear of gaining weight are not appropriate in the treatment of ARFID. While there is no evidence-based treatment for ARFID to date, individuals in my own practice presenting with underlying Orthorexia have responded favorably to Exposure Response Prevention (ERP) together with Acceptance and Commitment Therapy (ACT). Combined with collaborative goal setting, developing coping skills while working with exposures to avoided foods has been particularly effective. We begin treatment by developing a treatment plan that outlines goals and measurable objectives. This is followed by several exercises that help clients to identify their top three values, which will be used to help motivate decisions going forward. Next, an exposure hierarchy is developed beginning with low-intensity exposures to increasingly more intense challenges, which includes foods that have been completely avoided as dietary options. As we work up the hierarchy, core fears are explored. Exposures test the client’s hypotheses about foods while feared consequences are rate and discussed using the Subjective Units of Distress Scale (SUDS, 0 = no distress, 100 = worst possible distress). Evidence to support or refute fears is discussed while repeating in vivo and/or imaginal exposures help to decrease avoidance, SUDS scores, and associated anxiety. With time, dietary restriction decreases, thereby helping the client to reintroduce important food groups and return to more balanced eating. Knowing what is underneath ARFID is important. For appropriate interventions, differentiation must occur within this diagnostic category as it is broad and captures other underlying challenges besides Orthorexia. For example, upon clinical assessment the client is presenting with ARFID due to an underlying fear of vomiting (emetophobia) or, perhaps, difficulty with food textures. In these cases, motivation as well as responses to and avoidance of the feared object differ so treatment exposures will also be different. In the treatment of Orthorexia, clients learn that “pure, clean” eating for health can, in fact, become a very unhealthy practice when physical and mental health are compromised by nutritional deficiencies, or extreme weight loss, or a diminished quality of life.